C: This location was supported by 39% of survey respondents. The land falls within the coastal protection belt but has no views of the river. It is also not visible from Colchester Road so would not affect the rural nature of the approach to Wivenhoe. Very near to services such as schools, shops and bus routes. Low impact on overall vehicular road traffic in the town. 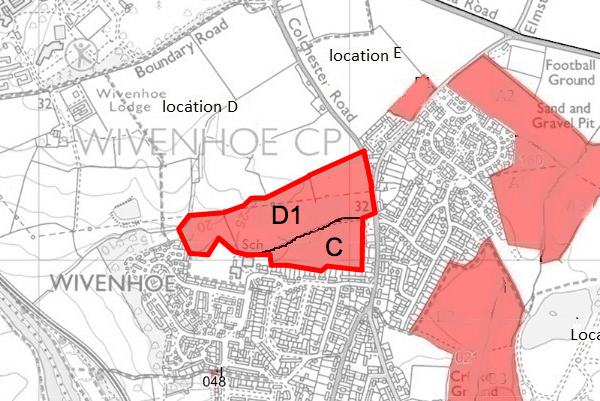 The area suggested for housing is 3.56 ha. (The total proposed by the landowner is 9.3ha). D1: There was strong resistance in the survey to building on the “green wedge”. Development here would impact on rural approach to Wivenhoe so only part of the site put forward by the developer is being suggested.